HCA football | Rockwall Rocks! Rockwall’s Heritage Christian Academy celebrated its homecoming Friday night with an exciting 52-48 victory over Arlington Fellowship Academy, stopping AFA on the five-yard line as time expired. In the see-saw battle which saw seven lead changes, HCA scored the winning touchdown with just over a minute to go, when junior Asa Burke caught an 11-yard pass from junior quarterback Austin Pettit, Burke’s second TD of the night. Click here to read the rest of the story at TheRockwallNews.com. A cold front moved through the area this morning, bringing gusty winds and leaving temperatures in the mid-50s. It is expected to fall into the mid-40s by 9 pm tonight. Rockwall-Heath and HCA High School football fans attending Friday night and Saturday afternoon football games at Texas Stadium and Central Texas Christian School, respectively, should also prepare to dress warmly. Friday will start off with temperatures in the mid-30s and it won’t warm up much more than that, according to National Weather Service meteorologist Daniel Huckaby. Friday’s high is expected to reach the low 50s. “It’ll be sunny again but quite cool, probably the coolest day we’ve seen since last winter,” Mr. Huckaby said. The weekend won’t be much warmer with temperatures in the 40s and 50s. Mr. Huckaby said to expect a lot of clouds and maybe even light rain or drizzle. “It’s certainly going to feel more like winter,” he said. Next week won’t be extremely warm either, but Monday, Tuesday and Wednesday are expected to bring temperatures in the high 60s, he said. For more local news and event info, visit www.rockwallrocks.com. Celebrating its homecoming, the Rockwall HCA (Heritage Christian Academy) Eagles opened district play with an impressive 68 to 24 victory over visiting Lakehill Preparatory Academy Friday night. HCA jumped out to a 24-0 first quarter lead in cruising to its win. 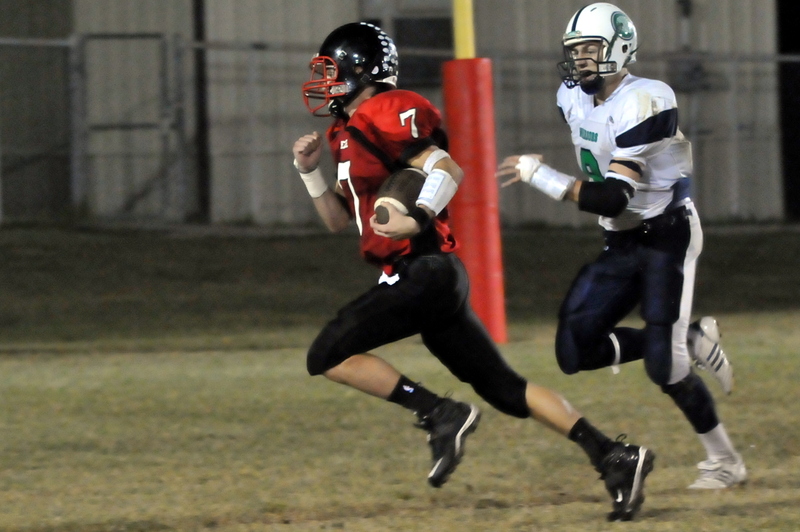 HCA was led by senior quarterback Zach Read, who threw for six TD passes, completing 11 of 12 passes for 278 yards. On defense, Read also intercepted two passes, returning one for a TD. Seniors Josh Peschell, Josh Points and Noah Ward each caught two TD passes, while senior Kevin Prater rushed for two TDs. Sophomore kicker Aaron Mateer rounded out the scoring, converting 7 of 9 PATS for 14 points. The No. 1 ranked team in TAPPS Six-Ma, HCA (6-1), will return to district action next Saturday, October 25, when the Eagles visit The Covenant School of Dallas (5-2) with a 2 pm kickoff. For more local sports scores, stories and photos, visit the Sports page at http://www.rockwallrocks.com. TAPPS six-man, No. 1 ranked, Rockwall Heritage Christian Academy Eagles routed the visiting Austin Christian Home School Cougars, 62 to 12, Friday night, with the game ending at half-time pursuant to the 45-point mercy rule. Senior HCA quarterback Zach Read rushed for 2 TDS and passed for 4 TDS in leading HCA to the victory. Read completed 6 of 7 passes for 178 yards and rushed for 40 yards on 3 attempts. Senior receiver Spencer McAfee caught two TD passes of 21 and 53 yards, respectively. Senior running back Josh Points scored twice, rushing for one TD and catching a 31-yard pass. He rushed for 96 yards on 7 attempts. HCA (5-1) will return to the gridiron on Friday, Oct. 17, for its homecoming game against visiting Lakehill Preparatory School (4-3) in its first District match of the year at Rockwall’s Dobbs Elementary’s Wisdom Field, beginning at 7:30 p.m.